Sorrento is a beautiful town perched on a cliff high above the sea with views of Vesuvius and the islands in the Bay of Naples . Use this website to help you plan a visit to this elegant southern Italian resort and find your way to the best beaches and some lovely villages and towns along the Sorrentine peninsula that are perhaps less well known to tourists. 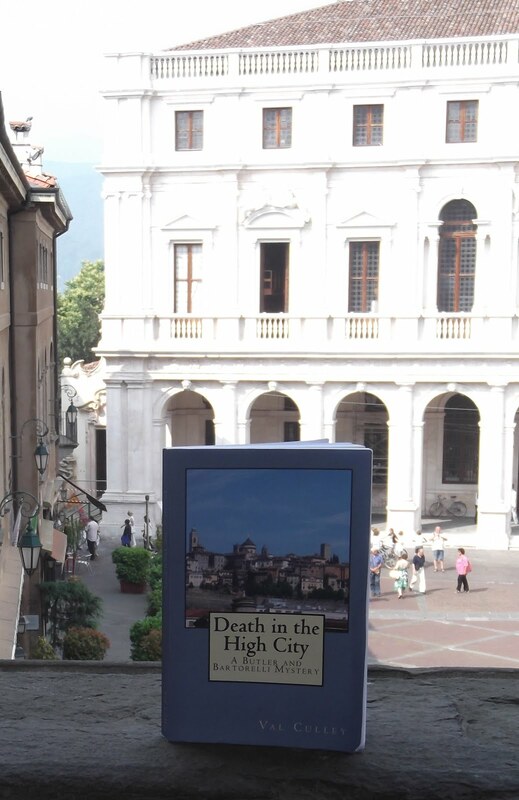 Death in the High City, the first British detective novel to be set in Bergamo in northern Italy, has had an exciting first year. The novel, which was published in Kindle format on Amazon 12 months ago today, has sold copies in the UK, Italy, America, Australia and Canada. A paperback version of Death in the High City was published in July 2014. Author Val Culley has had some heart warming emails and messages about the book from readers both in the UK and abroad and has been delighted with the level of interest in her first novel. In October 2014 Val was a guest at the fifth anniversary celebrations of Bergamo Su e Giù, a group of independent tour guides in the city. 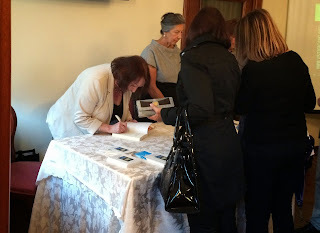 She was invited to present Death in the High City to an audience in San Pellegrino Terme and sign copies of the book and she also made an appearance on Bergamo TV to talk about the novel with presenter Teo Mangione. In November the book was purchased by Leicestershire Libraries and is now in stock at Loughborough, Shepshed, Ashby de la Zouch, Coalville, Castle Donington and Kegworth Libraries and is going out on loan regularly. In April this year Val was invited to Bergamo again to present her novel to a group of 80 Italian teachers of English and to sign copies. She made a second appearance on Bergamo TV and also formally presented a copy of Death in the High City to the Biblioteca Civica (Civic Library) in Piazza Vecchia, a location that is featured in the novel itself. 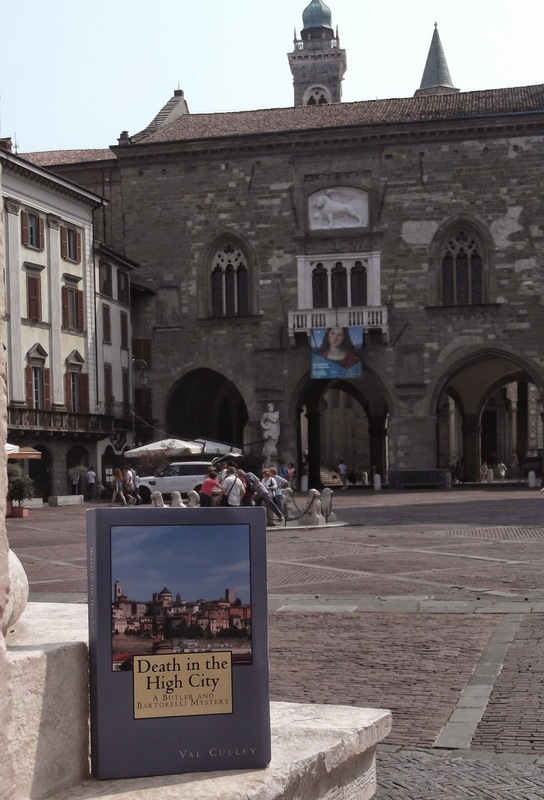 Death in the High City centres on the investigation into the death of an English woman who was staying in the Città Alta while writing a biography of the composer Gaetano Donizetti. The novel is the first of a series to feature the characters of Kate Butler, a freelance journalist, and Steve Bartorelli, a Detective Chief Inspector, whose family is from Sorrento and has just retired from the English police. The victim had been living in an apartment in Bergamo’s Città Alta and much of the action takes place within the walls of the upper town. The local police do not believe there is enough evidence to open a murder enquiry and so Kate Butler, who is the victim’s cousin, arrives in Bergamo to try to get some answers about her death. Kate visits many of the places in the city with Donizetti connections and her enquiries even take her out to Lago d’Iseo and into the countryside around San Pellegrino Terme. But after her own life is threatened and there has been another death in the Città Alta, her lover, Steve Bartorelli, joins her to help unravel the mystery and trap the killer. The novel will be of interest to anyone who enjoys the ‘cosy’ crime fiction genre or likes detective novels with an Italian setting. Val is now working on a sequel, Death in Sirenland, set in Sorrento in southern Italy. Death in the High City by Val Culley is available on Amazon.com. A good guide book for visitors to Sorrento is Frommer's Amalfi Coast, which has a whole chapter devoted to the town and its peninsula, including information on lesser known attractions of the area that other guide books sometimes ignore. This book takes readers on a tour of the Sorrentine Peninsula, starting from Castellamare di Stabia, with details of other places on the peninsula such as Vico Equense, Massa Lubrense, Sant’Agata su due Golfi, Nerano and Termini. Buy Frommer's Amalfi Coast with Naples, Capri and Pompeii direct from Amazon. A cosy crime novel set in Lombardy in northern Italy, Death in the High City is believed to be the first British crime novel to use Bergamo as its location. Sorrento is an historic coastal city in Italy’s Campania region, situated 50km to the south of Naples . It is served by the international airport at Naples and can be reached by rail, road or boat. Sorrento is a good base for visiting the islands of Capri, Ischia and Procida, the Amalfi coast or the Roman ruins at Pompei and Ercolano. The Shooting in Sorrento, a new crime novel set in the resort, is now available from Amazon. The second Butler and Bartorelli mystery by Val Culley, it is the sequel to Death in the High City, which was set in Bergamo in Lombardy. If your love of Italy stretches beyond Sorrento and the south, you may enjoy visiting our sister sites, devoted to the elegant and historic northern Italian cities of Bergamo and Padova. Situated just north of Milan and close to the lakes and mountains, Bergamo has become a familiar name because of its major international airport but is an attractive place to visit in its own right, combining contemporary sophistication with medieval charm. Padova, an elegant city in the Veneto less than half an hour by express rail services from Venice, boasts a picturesque historic centre, one of the world's oldest universities and notable buildings including the Scrovegni Chapel, which houses a renowned cycle of frescoes by Giotto that is recognised as a masterpiece of western art.